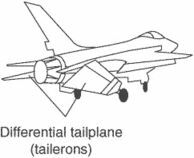 A tailplane that both acts as an elevator and provides some or all roll control. When acting as an elevator, both tailplanes go up or down equally. Their travel is differential when they provide roll control.